We are pleased to announce that BentProp has changed its name to Project Recover. Our mission, vision, and values will remain exactly the same, and we will still send you regular updates on our search for MIAs. We simply retired the name in favor of Project Recover for unity and clarity. Much has been happening over the past 12 months in the growth of our organization. From our previous newsletters, you know we met Mark Moline, and his University of Delaware team, and Eric Terrill, and his Scripps Institution of Oceanography team in 2012, began working with them in 2013 and made great strides together in 2014 finding the Savage Avenger and the Punnell Hellcat MIA sites. In 2014, we also met Dan Friedkin when he came to create the documentary, Found (which is nearing completion!). As a result, in 2015, The BentProp Project team along with the University of Delaware and Scripps teams, received an incredible donation from Dan Friedkin which allowed us to expand globally. We decided to call this union of forces dedicated to and causing recoveries to occur, Project Recover. Conducted 28 missions in 13 countries. Identified and documented 29 US and foreign aircraft (23 US/6 Foreign). The 23 US aircraft have been linked to at least 81 MIAs. 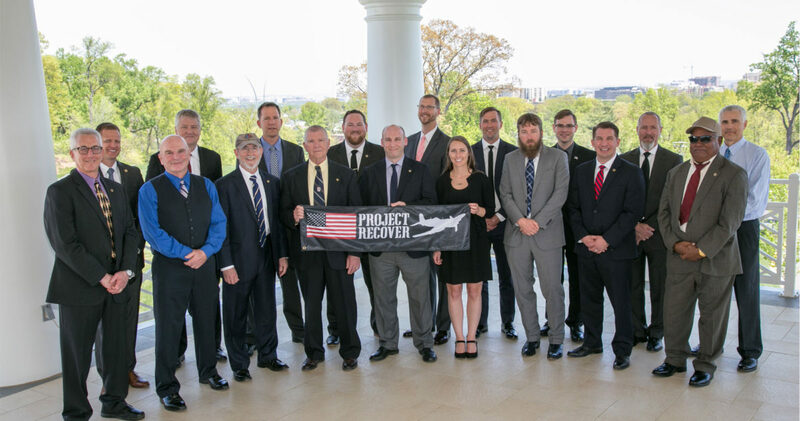 The Defense POW/MIA Accounting Agency (DPAA) and its predecessors have conducted 4 recovery missions based on data supplied by Project Recover. Through Project Recover’s collaborative efforts with DPAA, 5 US Airmen have been accounted for and repatriated to their families in the United States. This is pretty amazing and far beyond any expectations we might have had when we first joined forces. As the Project Recover partners have increasingly worked with each other, we started to realize that, unified as we are in operations, unification under a single name should be our next logical step. Accordingly the BentProp board of directors, in concert with Mark Moline and Eric Terrill, have made the decision to retire the name of BentProp and assume the single name of Project Recover. As we grow, this will help with communications with DPAA and other government agencies, potential donors and, most importantly, with MIA and POW families who will now only have to look in one place to get information and updates. As you might suspect, retiring the name, The BentProp Project, has not been without its emotional aspects. However, The BentProp Project board unanimously felt that this change was needed for unification of structure and branding, as we grow jointly as an organization. We have not forgotten that our Mission is what is most important – and anything that better supports our Mission is a good thing: this change is a good thing. We are gratified that you have been following The BentProp Project and now we ask that you follow Project Recover as our mission has not changed: find our MIAs wherever they might be. Let us know your thoughts as we make this change that can dramatically affect our capabilities to fulfill our mission. It is our honor and pleasure to make all of this happen for the families. We have not kept a list of aircraft names associated with our discoveries and documentations. In some cases the aircraft did not have a “name”. Have you gone into dpaa.org? Follow steps to which War and State. You might find what you are looking for that way. We have just basic information on the loos of your Great Uncle’s B-17 over the Netherlands. Expect an email from us requesting any additional intel you may have that could assist us and how to contact DPAA, the US govt agency.